The following article was contributed by Ann Flaherty, Superintendent of Schools in the Diocese of Owensboro, KY.
God said: This is the sign of the covenant that I am making between me and you and every living creature with you for all ages to come: I set my bow in the clouds to serve as a sign of the covenant between me and the earth (Genesis 9:12-13). 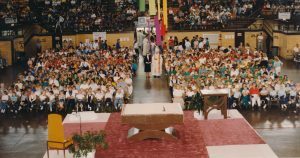 The Rainbow Mass was founded in 1985 under Bishop John McRaith. Sr. Amelia Stenger, OSU, Superintendent of Catholic Schools, PACESS (Principals and Administrators of Catholic Elementary and Secondary Schools) and DOCE (Diocese of Owensboro Catholic Educators) worked together to plan the first Rainbow Mass celebration, which took place on September 18, 1985, in Owensboro, Kentucky’s Sportscenter. 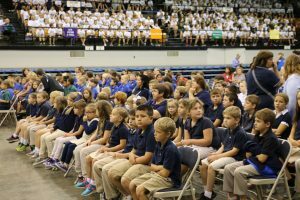 More than 5,300 students from 29 schools came from across the diocese, which serves 32 counties. Sr. Amelia stated in a phone interview that the Rainbow Mass was patterned off the Catholic Student Mission Crusade (CSMC) Masses. While a high school student at Mt. 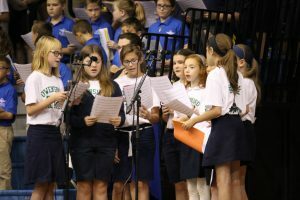 St. Joseph Academy, she sang in the school choir for the CSMC Mass. 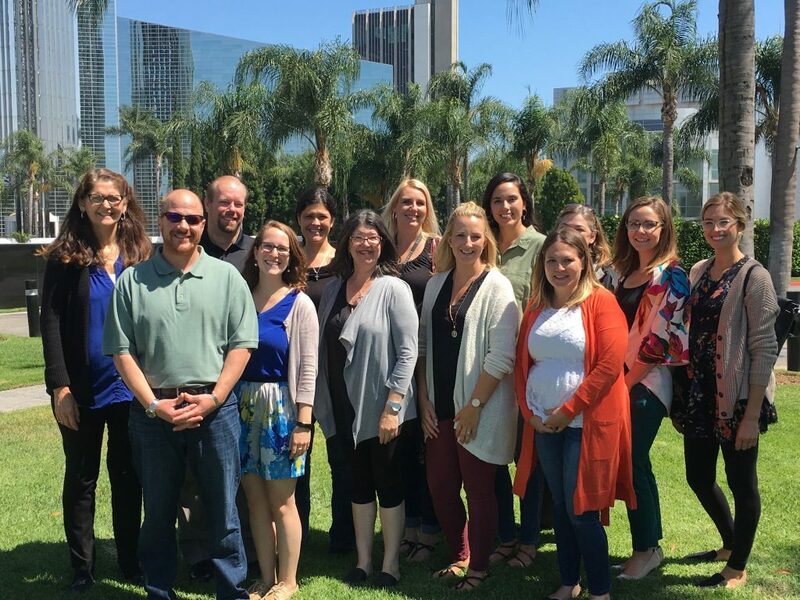 Catholic school students, Kindergarten through Brescia College, came from across the Diocese to attend the day-long celebration designed to further the work of home and foreign missions. The CSMC, under the direction of Fr. George Boehmicke, CSMC Director, was held annually in the sports center after its completion in the 1950s. The Rainbow Mass continues to occur every other year. 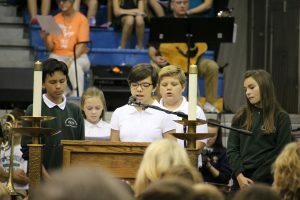 The 17th Rainbow Mass was celebrated in the fall of this school year. 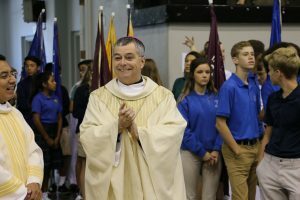 All 17 Catholic schools within the Diocese of Owensboro came together to celebrate the liturgy with Bishop William Medley. Also, Brescia University students, faculty and staff are invited as well as the Ursuline Sisters of Mount Saint Joseph. Pastors and Deacons of each parish that oversee a Catholic school attend and take part in this celebration. Parents, younger siblings and grandparents attend the celebration as well. Fr. 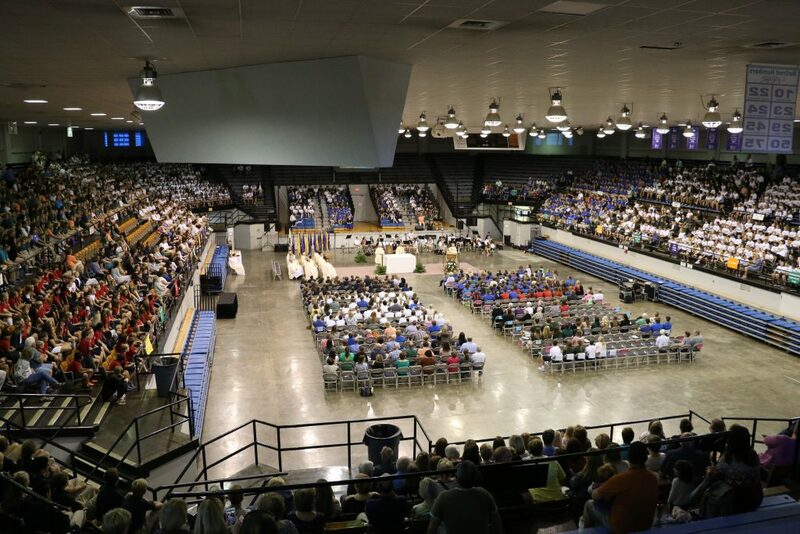 Brandon Williams, a Diocese of Owensboro Catholic schools graduate, who served as the Master of Ceremonies for Episcopal Liturgies, fondly remembers the many Rainbow Masses he attended as a student. He was thrilled to be able to serve the schools he once attended in his new role. The Catholic School and Liturgy Offices and each school community are involved in the planning and implementation of the Rainbow Mass. The elementary students serve the Mass through the Presentation of the Gifts and their school flags. The middle school students take part by being altar servers. This year one of our bilingual middle school students read the first reading in Spanish. High school students serve in a variety of ways: Prayers of the Faithful, lector, hospitality, accompanying priests to Communion stations and helping to break down the Sportscenter after the Mass has concluded. School music teachers and a band director plan the music, bring students to sing in the choir, and play the instruments. 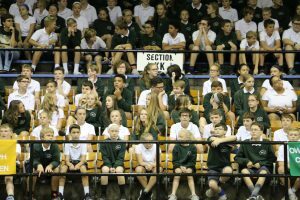 The Rainbow Mass is truly all of our Catholic schools working together to praise God for the great gift of our Catholic Church and especially the Mass. Those interested in learning more about planning a diocesan level gathering celebration of the Holy Sacrifice of the Mass can contact Ann Flaherty. This celebration is an ideal way to begin the school year or celebrate Catholic Schools Week. Special thanks to Diocese of Owensboro Archivist, Heidi Taylor-Caudill and the Diocese of Owensboro communications team members: Tina Kasey, Elizabeth Barnstead and Laura Clarke for their assistance with researching historical documents and pictures in preparation for this blog post.